Mbilia Bel and Tabu Ley were an instant hit. Their first song together was Mpeve Ya Longo which literally means Holy Spirit in Kikongo. The song was about the domestic problems that married women face. More hits followed soon like ; kelhia which was an update of Tabu Ley's hit song from the 1970s. Lizanga Bambanda was recorded seperately by Tabu Ley and Mbilia Bel. There was Faux pas in which Mbilia warns off her love rival, Eswi yo wapi in which she tells another person essentially to mind their own business, There were other hits like Beyanga , Wendenda and Nadina which had both Lingala and Kiswahili versions. The biggest hit of all was probably "Mobali na Ngai wana (which means This husband of mine). In the song she lavished Tabu Ley with praises such as He is rich , handsome , gifted etc. Mbilia Bel became the first female singer to gain acclamation throughout Africa. Tabu Ley and Mbilia Bel later got married and had one child together. The child was named Melody. In 1986, Tabu Ley added yet another female vocalist to Afrisa. Her name was Itela Boqetsu. Her stage name was Baniel. Her tenure in Afrisa was short and she soon left. Tabu Ley replaced her with another female singer : Kishila Ngoyi known by her stage name Faya Tess. 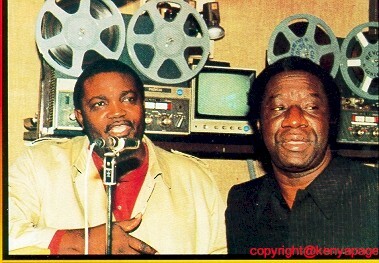 In 1987 Afrisa embarked on a tour of East Africa in which Mbilia Bel and Faya Tess sung together on stage. The hit song Nadina featured vocals from both. Meanwhile Afrisa had been strengthened by guitarist Huit Kilos from Victoria Eleison who stepped into the breach left the departing Dino Vangu. Also joining in 1987 was Ndombe Opetum who had played with Afrisa in the 1970s before joining OK Jazz and before creating his own band Orchestre Afrizam with limited success. 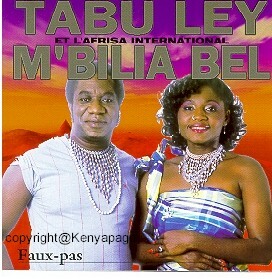 In 1988 Mbilia Bel and Tabu Ley parted ways. Both were cagey about the circumstances that led to their divorce but rumour has it that Mbilia Bel was not amused at Tabu Ley's introduction of another female vocalist known as Faya Tess. It was also rumoured that Gabonese producer "Ngoss" Ngossanga who was previously associated with Tabu Ley was the key catalyst in the split between Tabu Ley and Mbilia Bel. Mbilia Bel having left the band joined Paris based musician Rigo Makengo and produced several albums with mixed success. The rest of the Afrisa band including Kuleta and Modero were equally prolific in their productions such as Amilo and Sanza Misato Among others. (too bad I have never found these songs on CD). The band received a huge blow in the early 80s when Kiesse Diambu Defected over to TPOK Jazz to Join his brother Ntessa Dalienst. In 1985 when the Government of Kenya banned all foreign music from the National Radio service, Tabu Ley composed a song in praise of the president and the ban was lifted promptly. Yet another stroke of genius from Tabu Ley. After Mbilia Bel's departure however Afrisa's influence along with that of their rivals TPOK Jazz continued to wane as fans gravitated toward the faster more diluted version of Soukous which only features the Sebene section. Tabu Ley continues to perform today. He has remained faithful to the version of Soukous which he invented. This version features 3 parts. A slower introductory part which builds up to a mid tempo harmony building section and finally to the searing release of the sebene .